Mix the flour, salt and yeast in a bowl. Pour in the water and oil, knead to form a soft, smooth dough. Cover and leave to rise at room temperature for approx. 1½ hrs. until doubled in size. Bring the water and cochineal to the boil, simmer for approx. 5 mins. Add the eggs, boil for approx. 1 min., drain and dab dry. Brush the eggs with the oil. Knead the bacon and thyme into the dough. Divide the dough into two portions, shape into strands approx. 60 cm long. Twist the strands of dough together and join the ends to make a wreath. Place the wreath on a baking tray lined with baking paper. Gently open up the twists, insert the eggs. Cover the wreath and leave to rise at room temperature for a further 30 mins. 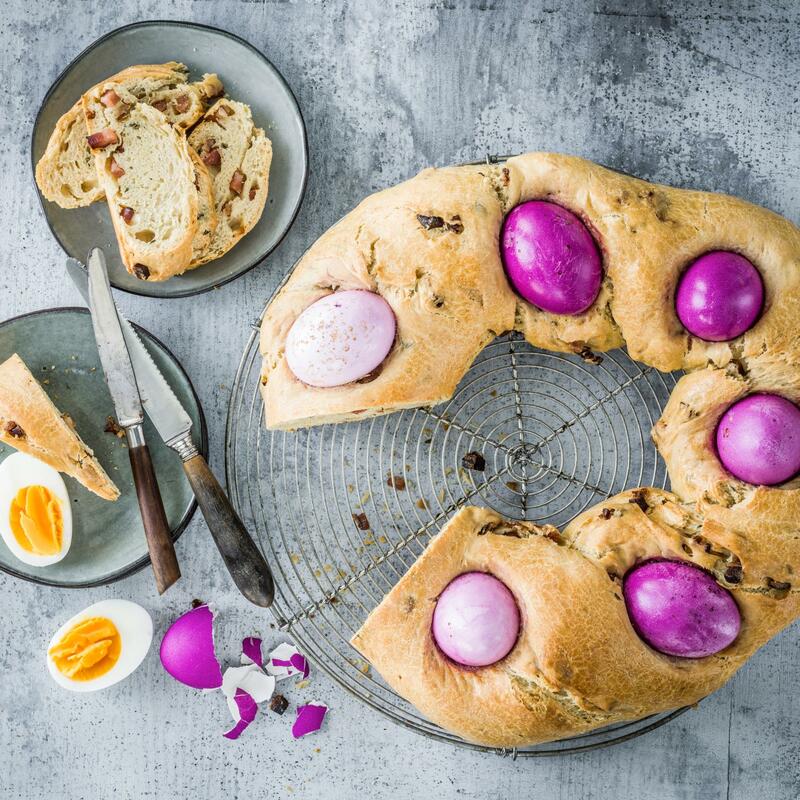 Glaze the wreath with a little egg. Approx. 35 mins. in the lower half of an oven preheated to 200°C. Remove from the oven, leave to cool on a rack. The cochineal is a scale insect that originates from Central and South America. The red dye, Carmine, comes from the female insects. Cochineal is available from Coop Vitality pharmacies.